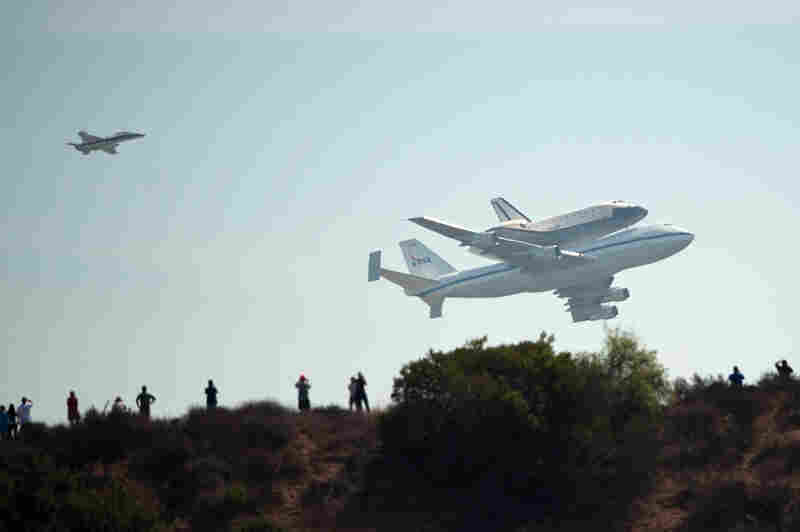 Touchdown: Space Shuttle Endeavour Lands In Los Angeles : The Two-Way Riding piggy-back atop a Boeing 747, the shuttle performed a fly-by at several iconic spots, from Malibu and Santa Monica to the Getty Center, the Griffith Observatory, and Vandenberg Air Force Base. 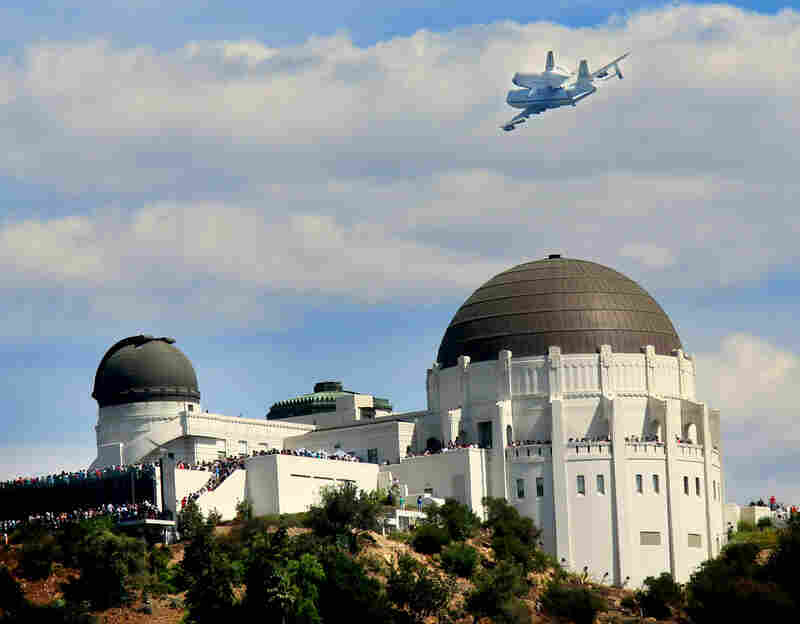 The space shuttle Endeavour flies atop NASA's Shuttle Carrier Aircraft or SCA over the Griffith Park Obervatory in Los Angeles. The Space Shuttle Endeavour passes the Hollywood Sign and the Griffith Observatory as seen from Dodger Stadium Friday. 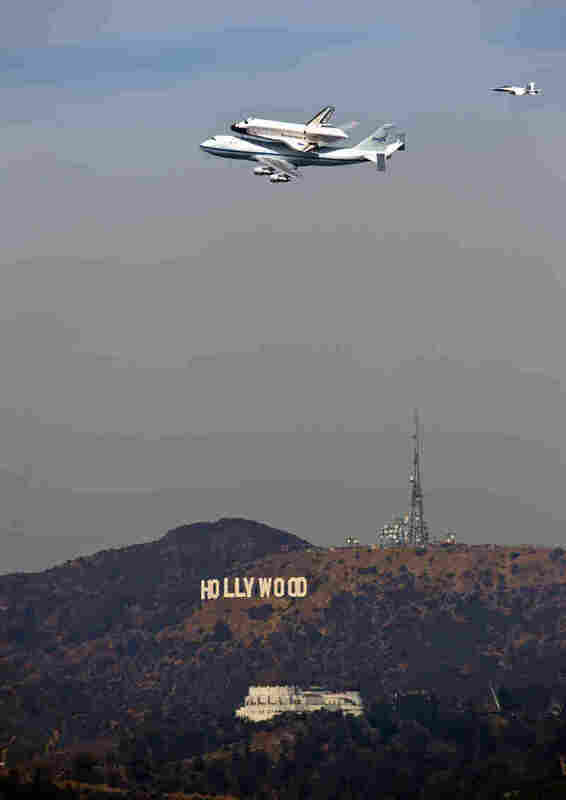 The space shuttle Endeavor flies by Griffith Observatory on its final voyage to the California Science Center in Los Angeles, Calif., Friday. 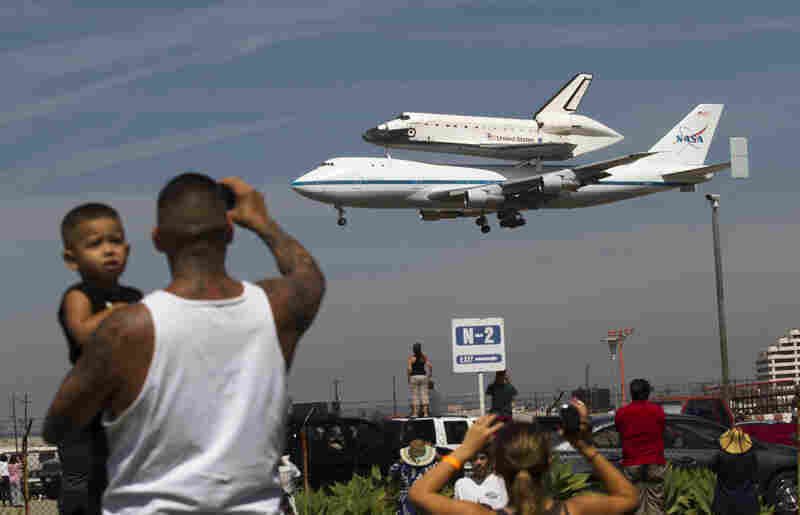 Spectators take pictures with varied levels of excitement, as the Space Shuttle Endeavour, mounted on NASA's Shuttle Carrier Aircraft, flies near Santa Monica. Spectators Mario Vasquez of Redondo Beach and his son Mario Jr., 2, watch as Endeavour prepares to land at Los Angeles International Airport Friday. In a few weeks, the shuttle will travel through the city's streets to its new home at the California Science Center. Space shuttle Endeavour and its Shuttle Carrier Aircraft land at Los Angeles International Airport. The Space Shuttle Endeavour has landed safely in Los Angeles, after giving admirers around the city a chance to take historic photos of its last flight. "Amazing, amazing, amazing," Derek Johns, 41, told The Los Angeles Times. Johns took photos from a pier. "I got chills," El Segundo councilman Dave Atkinson told the paper. "This is America at its finest." 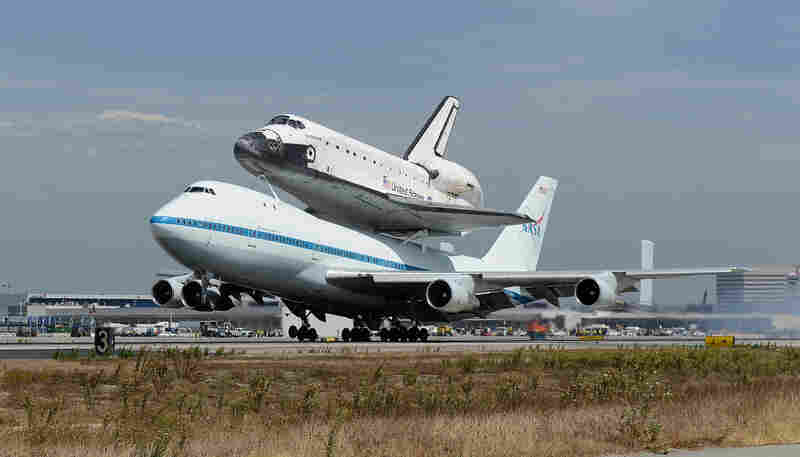 Riding piggy-back atop a Boeing 747, the shuttle performed a fly-by at several iconic spots, from Malibu and Santa Monica to the Getty Center, the Griffith Observatory, and Vandenberg Air Force Base. It also flew past the Hollywood sign. On Twitter, actor John Gallagher, Jr., put it this way: "Eating cereal in your robe & gazing out the window is exciting enough but when u see a space shuttle on a plane fly by H'wood sign? Woweee!" As Mark reported earlier, the shuttle also passed by other California landmarks, such as the Golden Gate Bridge. On its Twitter feed, the California Science Center, which will put Endeavor on permanent display, announced "Somebody pinch us. Because this. Is. Unreal." As you might imagine, the shuttle didn't exactly taxi to a gate at Los Angeles International Airport. Instead, it'll spend a few weeks in a United Airlines hangar, being prepared for its final journey — by land - to the science center. The center has posted a map of that route, to allow spectators to watch the shuttle drive by in about three weeks. As we reported earlier this month, the 12-mile route between the airport and the shuttle's final home had to be cleared of several hundred trees, to make room for the spacecraft's 78-foot wingspan. Endeavour is the third shuttle to reach its final home after the shutdown of the NASA program. Discovery now resides at the Smithsonian National Air and Space Museum outside Washington, D.C., and Enterprise is at New York's Intrepid Sea, Air & Space Musuem.